Check out details about Android 10 aka Android Q release date, Android Q name, eligible phones list and everything about Android Q update. Talking about Google's mobile OS, Android 8.1 Oreo was the newest version, until Android 9.0 Pie release in August 2018. The next version will be Android 10 aka Android Q. Check out Android Q Release Date, Android Q Name and list of eligible phones to get Android Q update. --> A total of three Android Q developer previews will be available for Pixel and other qualifying phones. Android 2019 version will be called as the Android Q. The Google mobile operating system has completed more than 10 years now and it will be a special 10th edition update. Are you thinking what I think? Yes, you are! Can we expect anything special from Google for successfully completing 10 years in mobile development? Obviously, there should be one such! Will Google name it as Android X following the Apple announcement of iPhone X as a revolutionary device? I believe that would be a surprise to every Android fan! Yeah! The Android 10 has a name. Google has always followed a tradition of naming its new Android version with a dessert name in alphabetical order. The tenth update of Android OS i.e., the Android name will start with English letter Q. That sounds like unknown names out there! So will it be Android Quiche, Android Quinoa, Android Quaker Oats or Android Quesadilla, the name of new Android Q version? More reasons why Google shouldn't go with Android 10 name this year and go ahead with Android X. Or alteast if the search engine giant has to name it by Q dessert then, I think they should be going with Quinoa Pudding because Android Quinoa sounds like a good name. This year at Google I/O event, Android 9.0 P was announced but didn't get a name. It's July 2019 and still, we don't have a name for this treat. The Android Q or the Android 10 release date is expected to be at Google I/O 2019. The event usually happens in the month of May every year but dates of next year events are not announced. This year event will be held from 8 May to 10 May. The update will be available through Android Q developer preview 1 release first and then there will be a second developer preview release too. Then there will be an official Android 10 Q update. After the Android Q rolls-out in May 2019, there will be a minor Android 10.1 update. The Google Pixel 3 and Pixel 3 XL are expected to run on Android Q version. The Android Q version will have the following incremental updates. I am sure you are looking for this column because it's the checklist which you consider when upgrading the software to the latest version because it contains certain features. As of now the full list of expected features isn't known yet but it's leaked at XDA forums that Android Q could introduce assisted dialing feature. It's a helpful feature for the people who travel internationally very often. What it does, it adds appropriate country code automatically. We are not sure how would that be implemented but that feature will make Android more separate from iOS. This feature is already available in a few smartphones from various device makers but it's not yet implemented on Android as a native feature. The Android Q update will be rolled out to a number of smartphones. The list could actually break the century barrier. The update will be available to a number of Google, Nokia, Motorola, OnePlus, Samsung, Huawei, Xiaomi, Sony, LG, HTC, and other smartphones. The official list will be out when the update is announced. HTC, as usual, will provide the update within the 90 days. Samsung and Xiaomi have the tedious task of updating a long list of smartphones. As a known fact, the Google Pixel devices will be updated first followed by Android One and Android Go smartphones. Then it could be Samsung, Xiaomi or OnePlus. That's a benefit for HMD Global. Already they have planned Android Pie roll-out to 16 of their smartphones. If anyone company that is seen driving innovation in smartphones, it's the Vivo Mobiles. From coming out with the first smartphone with an in-display fingerprint sensor to Nex S and Nex A smartphones, Vivo has stepped up in terms of innovation in the mobile industry. All the happy Vivo customers are now looking forward to the latest software update on their device. Vivo should care about it. Luckily there is FunTouch OS 5.0 which will be released by Vivo. The OnePlus 6 is one the probably to receive the Android 10 upgrade. Just like OP6, the OP 6T will also be upgraded to 2019 Android version. Note: That's just an indicative list and it includes only devices which are officially launched. More devices will be added as we get near the update release date. The all new Android Q tones (alarm and notification) are available for download and porting on your existing smartphone. 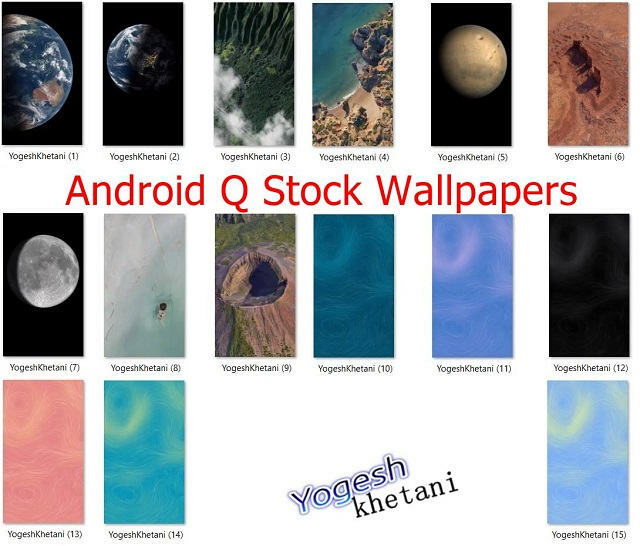 The Android Q stock wallpapers are available for download and use on your existing Android smartphone. There a total of 15 new wallpapers release by Google in the developer preview 1 as right now available for Pixel devices only. But good thing is that these new Android Q wallpapers can be ported to any Android mobile phone. So what do you think Android Q name will have to be? Do let us know! Do subscribe to our blog email updates. Details about Android 10 aka Android Q release date, Android Q name, eligible phones list and everything about Android Q update. Also go through Android Q phones, Android Q wallpapers, ringtones, boot animation.